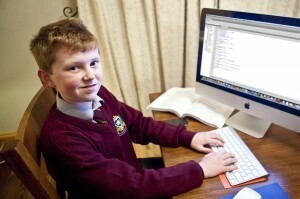 In 2012, 12-year-old Jordan Casey from Waterford, Ireland, became the youngest iOS app developer in Europe and one of the youngest in the world, when his first game, Alien Ball Vs Humans, went on sale on the Apple App Store. The game, inspired by Space Invaders, went to the top of the Apple iTunes store in Ireland. His passion for programming started when Jordan was 9-years-old. He was playing a Flash multiplayer game, called Club Penguin, and saw that other kids were developing websites and blogs about it. After creating his own blog assessing other people’s games, he decided to try developing his own games, so he learned 3 languages: HTML, ActionScript 2.0 and CSS and created his own website, Casey Games. By the age of ten, his website was receiving over 50,000 hits. He subsequently created Alien Ball vs Humans 2 and a puzzle-adventure game called Greenboy Touch. In an interview, he revealed: “The first two games I developed cost 89 cent each to download. I am using a premium payment system on my Greenboy Touch game. You get the first part of the game free and you pay for the rest.” After initially offering them for free, in order to build up momentum, he started changing for them after a few weeks. During the 2012 Cannes Lions Festival for Creativity in Communications, where he appeared as a guest panelist, he met a representative of Fabrica Brasil, a Brazilian advertising company, who asked him to develop an Android game, called Save the Day, in honor of International Children’s Day in Brazil. The game was played more than 15,000 times on Fabrica Brasil’s website. Jordan has also developed one of the first Irish virtual worlds, Food World, a giant kitchen where players can create their avatar and explore the landscape and engage with friends. He developed this game with his first staff member, Aidan Blackett, a graphic designer. In 2012, Jordan launched his computer gaming creation company, called Casey, which has produced the four previously mentioned games, which have gotten over 1,500 downloads. Due to his young age, he could not become legally became its director, so he made his parents heads of his company. Jordan revealed that one of his greater challenges is making sure that the application enters the Apple app store, since, if the company finds the smallest problem with the game, they simply reject it. Jordan is also engaged in charity work, since 10 percent of his Greenboy game profits are donated to a cancer respite center in Waterford.